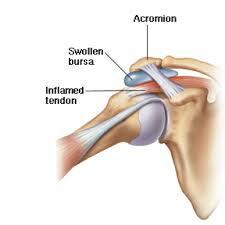 Your subacromial bursa is the most commonly inflamed of the shoulder bursa. Subacromial bursitis is a common cause of shoulder pain that is usually related to shoulder impingement of your bursa between your rotator cuff tendons and bone (acromion). Your subdeltoid bursa is less commonly inflamed shoulder bursa. Often there is an initial injury that sets off the process of inflammation. Thereafter, the problem can be self-exacerbating. Once there is an initial injury, the tendons and bursa become inflamed. This inflammation causes a thickening of these structures. The thickening then takes up more space, and therefore the tendons and bursa become are pinched upon even more. This causes more inflammation, and more thickening of the tendons and bursa, and so on.